Lebanese Arabic or Lebanese is a variety of Levantine Arabic, indigenous to and spoken primarily in Lebanon, with significant linguistic influences borrowed from other Middle Eastern and European languages, and is in some ways unique from other varieties of Arabic. Due to multilingualism among Lebanese people (the vast majority of the Lebanese people are trilingual - Lebanese Arabic, French, English), it is not uncommon for Lebanese people to mix Lebanese Arabic, French, and English languages into their daily speech. Vocabulary: many borrowings from other languages; most prominently Syriac-Aramaic, western-Aramaic Ottoman Turkish, French, and Greek, as well as, less significantly, from English. About 50 percent of the Lebanese grammatical structure is due to Aramaic influences. As a general rule of thumb, the voiceless uvular plosive /q/ is replaced with glottal stop [ʔ], e.g. /daqiːqa/ "minute" becomes [dʔiːʔa]. This debuccalization of /q/ is a feature shared with Syrian Arabic, Egyptian Arabic, and Maltese. Unlike most other varieties of Arabic, a few dialects of Lebanese Arabic have retained the classical diphthongs /aj/ and /aw/ (pronounced in Lebanese Arabic as [aɪ] and [aʊ]), which were monophthongised into [eː] and [oː] elsewhere, although the majority of Lebanese Arabic dialects realize them as [oʊ] and [eɪ]. In urban dialects (i.e. Beiruti) [eː] has replaced /aj/ and sometimes medial /aː/, and [e] has replaced final /i/ making it indistinguishable with tāʾ marbūtah (ة). Also, [oː] has replaced /aw/; [o] replacing some short /u/s. In singing, the /aj/, /aw/ and medial /aː/ are usually maintained for artistic values. 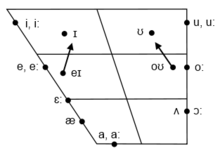 The main vowel phonemes in Lebanese Arabic. Lebanon's nationalist poet, Said Akl's book Yara and an excerpt from the book in his proposed Lebanese Arabic Latin alphabet, which Fairouz and the Rahbani Brothers had chosen for their song, "Yara"
Although there is a common Lebanese Arabic dialect mutually understood by Lebanese people, there are regionally distinct variations with, at times, unique pronunciation, grammar, and vocabulary. Beiruti dialects, further distributed according to neighborhoods, the notable ones being Achrafieh dialect, Basta dialect, Ras Beirut dialect, etc. Northern dialects, further distributed regionally, the most notable ones being Tripoli dialect, Zgharta dialect, Bsharri dialect, Koura dialect, Akkar dialect. Southern dialects, with notable ones being the Tyre and Bint Jbeil dialects. Beqaa dialects, further divided into dialects, the notable ones being Zahlé and Baalbek-Hermel dialects. Mount Lebanon dialects, further divided into regional dialects like the Keserwan dialect, the Matin dialect, Shouf dialect, etc. 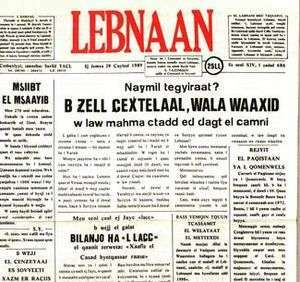 There is still today no generally accepted agreement on how to use the Latin alphabet to transliterate Lebanese Arabic words. In 2010, The Lebanese Language Institute has released a Lebanese Arabic keyboard layout and made it easier to write Lebanese Arabic in a Latin script, using unicode-compatible symbols to substitute for missing sounds. Capitalization and punctuation are used normally the same way they are used in French and English languages. Emphatic consonants are not distinguished from normal ones, with the exception of /zˤ/ represented by ƶ. Probably Said Akl did not acknowledge any other emphatic consonant. Lebanese Arabic verbs, even though they share root similarities with many Arabic varieties, have characteristics that set them apart from verbs in other Arabic varieties.